“The Santa Ana” by Joan Didion – most of this is true. In Los Angeles some teachers do not attempt to conduct formal classes during a Santa Ana, because the children become unmanageable. In Switzerland the suicide rate goes up during the foehn, and in the courts of some Swiss cantons the wind is considered a mitigating circumstance for crime. Surgeons are said to watch the wind, because blood does not clot normally during a foehn. A few years ago an Israeli physicist discovered that not only during such winds, but for the ten or twelve hours which precede them, the air carries an unusually high ratio of positive to negative ions. No one seems to know exactly why that should be; some talk about friction and others suggest solar disturbances. In any case the positive ions are there, and what an excess of positive ions does, in the simplest terms, is make people unhappy. One cannot get much more mechanistic than that. Easterners commonly complain that there is no “weather” at all in Southern California, that the days and the seasons slip by relentlessly, numbingly bland. That is quite misleading. 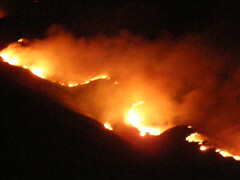 In fact the climate is characterized by infrequent but violent extremes: two periods of torrential subtropical rains which continue for weeks and wash out the hills and send subdivisions sliding toward the sea; about twenty scattered days a year of the Santa Ana, which, with its incendiary dryness, invariably means fire. At the first prediction of a Santa Ana, the Forest Service flies men and equipment from northern California into the southern forests, and the Los Angeles Fire Department cancels its ordinary non-firefighting routines. The Santa Ana caused Malibu to burn as it did in 1956, and Bel Air in 1961, and Santa Barbara in 1964. In the winter of 1966-67 eleven men were killed fighting a Santa Ana fire that spread through the San Gabriel Mountains. Previous Post New Mexico, 35 degrees.